What do these 4 points have in common? Well, 3 are a result of the other. In this case, contact point heavily influences launch angle, spin and total distance with a driver. Why is that? Most players can benefit by generating a higher launch with their driver. I only say this due to the fact most players I see are hitting down on the golf ball. When you hit down on the golf ball it brings the launch angle and total height of the shot down. Not ideal for long carry with low spin. If you contact the ball just 1 inch above center on a 10 degree driver (assuming the attack angle is zero,) that shifts the loft of the driver at the contact point from 10 to 15.2 degrees! In launch terms, that shifts the launch angle from 8.5 degrees with contact directly in the center of the face to 12.92 degrees with that same driver and a contact point 1 inch above center. This will tremendously impact both total distance and spin. Speaking of spin, take a look at the image here. 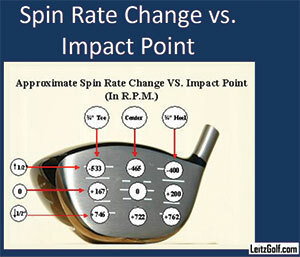 More specifically, how the spin rate can drastically change as the contact moves throughout the club face. The higher the contact point on the face, the lower the ball will spin. 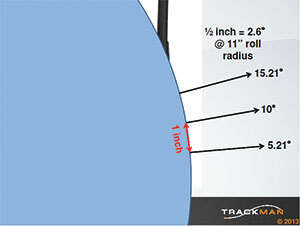 Thus rolling less when it hits the ground, resulting in more distance. Some of you might not know where the ball is contacted on the face with each shot. That’s okay. Go to a store and pick up Doctor Scholls foot spray and spray it onto your driver face prior to each shot. (Do not use on irons, you will start getting flyers like crazy that knuckle in the air) When the shot is struck, you can check the face and the moisture left on the face will have been disturbed by where the ball struck the face, thus leaving a mark. This gives you a perfect indication of contact point. Track your habits, improvements and progress with it. Scott Sackett, GOLF Magazine Top 100 Teacher the past 14 years, just voted as one of Golf Digest’s Best Teacher in the State for the 10th year in a row. Also, Director of Instruction at Park Meadows CC in Park City Utah (July-September) and while in Scottsdale teaches at McCormick Ranch Golf Club. If you would like to contact Scott, visit www.scottsackett.com.